A friend of mine recently showed me how to laminate at home without a laminating machine. 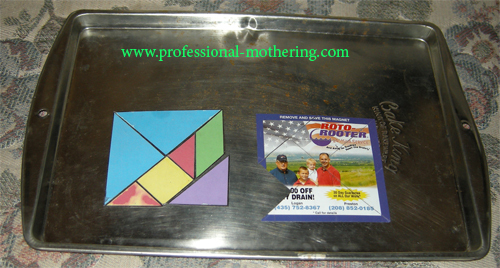 She uses a simple hot-iron, and it works beautifully for posters, lap-booking, small manipulatives, and anything else that you might want to laminate. She buys a big roll of THERMAL laminate, like the one pictured here from amazon.com, and irons it, as shown in the video. Another project I did with this laminate is to make magnets for the kids to play with. I printed out a tangram and laminated one side with the hot iron. Then I placed it on a sticker-magnet and cut it out, and the kids had magnetic tangrams to play with on a couple of cookie sheets that I bought at a second-hand store. Unfortunately the printer did some automatic sizing that made the tangrams be too small for our tangram puzzles. I also like to laminate with my laminating machine shown in the video. I buy 200 8.5"-11" sheets for $20 at Sam's Club, sized perfectly for printouts. The sheets are thicker and come out looking more professional than the homemade laminate does. However, I usually don't need professional, I just need durable, and the hot iron does the job at a much lower cost. I also LOVE not having to go to the craft store to do posters. The last time I did that with three little kids there was a lot of chaos. Never again! Have fun laminating! If you homeschool and have never laminated before, I HIGHLY recommend it!